DAVID R ROSS was born in Scotland near Glasgow at a very young age. He can trace his family tree back to the 1950's. For as long as he can remember he has had a passion for Scotland, its landscape, its traditions and its history. Every free moment is spent stravaiging around historic sites, battlefields, and castles. He is a keen motorcyclist, as many x-rays can prove. He is looking forward to all the arguments that will take place in the forthcoming Scottish Parliament, showing that the Scots never change. He is 6ft 5in and naturally blond, although he is developing a distinguished touch of grey around the edges. 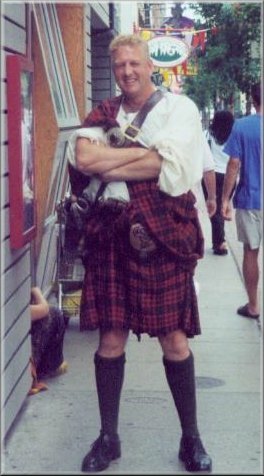 He also has the audacity to think he looks the business in a kilt. His life is an ongoing quest for the truth, as if personally burdened by the bitter-sweet legacy of Wallace. His favourite current saying is "Sorry, can't stop, I have a country to free." So states the blurb at the front of each of his books. Those privileged to know the man will recognise his pawky, sometimes almost black sense of humour. But there's a lot more to him than that. Anyone who has heard him talk of Wallace and his struggle during the Wars of Independence know that he is fired with an absolute passion for his subject. Each of those privileged enough to have been present at one of his talks carries away with them a sense of this man's devotion to the memory of his subject - and to Scotland herself. 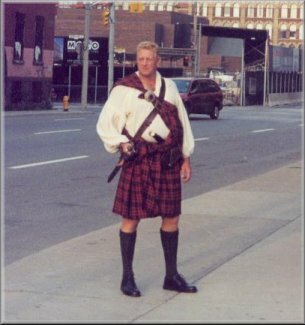 He's a big laddie, standing 6 feet 5 inches tall, and whether resplendent in full biker's black leathers, or the highland garb when he's running about in his ancient Mercedes, is a somewhat noticeable figure wherever he goes. A very approachable man despite his size, David is an excellent ambassador for Scotland. This is an article which appeared in the Sunday Herald on 11th January 2004, giving a brief outline of the preceding week in David's life as he prepares for the Walk. Unfortunately it was condensed quite a bit from the original one he submitted, a lot of the humour was cut out and it is a rather dry read! David was asked recently to write a piece for the Times. I'm not sure if or when it will be printed, so here it is just in case they don't run it. 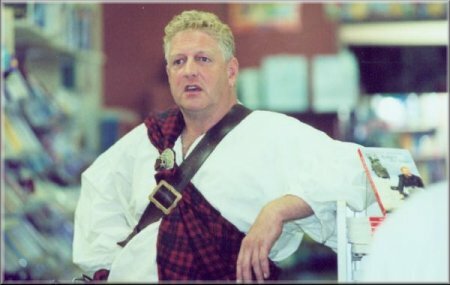 Some more of David's thoughts on Sir William Wallace.